Looking at the sea or red and pink Valentine’s merchandise in the shops might give the impression that everything is very much the same and nothing stands out. I can assure you, that it is simply not true, with some effort, each craft project can have a completely different feel. You may remember my rock’n’roll Valentine’s Day card. This newest project has a different vibe altogether. I was really in the mood to create a card with lots and lots of pink, which is unusual as pink is not the colour I normally go for. But hey, it’s for Valentine’s, so why not, right? The paper collection I chose to use is “Love Story” by Echo Park. If you like fuchsia pink, there’s plenty of it in this pad! I picked four complementing patterns from the collection, each in varying degrees of pink-ness, and arranged them in such a way that looked appealing to me and showcased every patten. I then matted them on my favourite textured American Crafts cardstock in burgundy. The darker colour picks up the deep red from the darkest pattern and also makes the papers pop against each other really well. I also added some fuchsia ribbon to the top layer for extra texture. One of my fairy Christmas cards last year featured a fancy decorative top (you can see the project here). I really liked the effect it created and decided that I wanted to use that element in my future projects. Fast forward a couple of months and here I am! I die cut “Anja’s Vintage Decoration” by Marianne Design from the same textured burgundy cardstock I used for matting the patterned papers. The element looks beautiful as it is, but I wanted to add some sparkle, so I left the cardstock in the die and stencilled the embossed areas with “Stardust” Stickles glitter glue. Once the glitter was dry, I glued the decoration to the back of the layered piece, and then adhered it all to the card blank. As the colour palette of this card is rather bright, I thought the best stamp to accompany it should be cheery and fun. 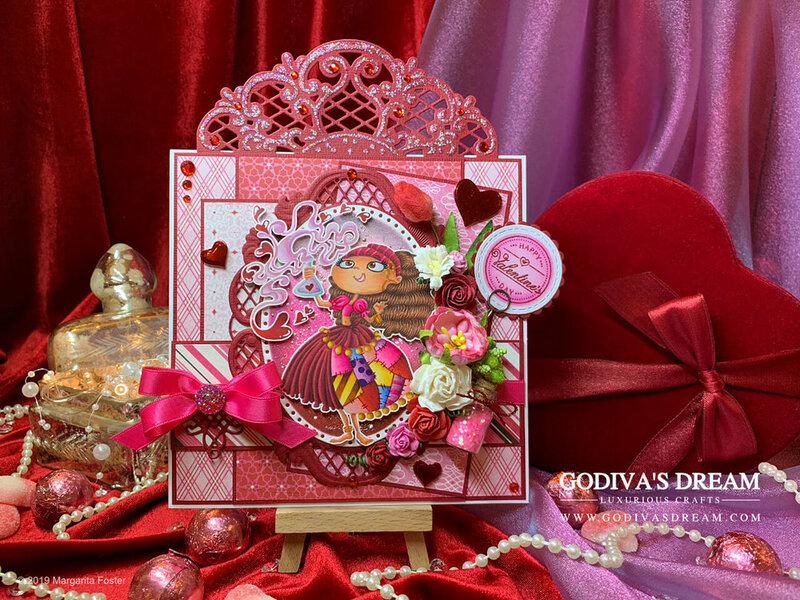 Thus, I picked “Josephine” by Annie Rodrigue for Kraftin’ Kimmie Stamps. I love this stamp, she has such a happy facial expression, I really like the swirly potion effect and the patchwork skirt detail is really sweet too. I stamped the image in Memento “Desert Sand” ink, so I could use the no-lines colouring technique. I have to say that while I sometimes still colour using black ink, the no-lines is definitely my favourite method. I used Promarker, Brushmarker and Copic alcohol based markers to colour Josephine. I chose a variety of shades that would complement the theme and feel of the project. The hair was somewhat challenging and it also took me quite a few test images to figure out the patchwork colours, but I’m happy with how it turned out in the end. I wanted to keep to the same colour scheme as the rest of the card when creating the background. However, I also didn’t want my image to blend in so much that it wouldn’t stand out at all. Firstly, I cut out an oval using “Anja’s Oval” die set by Marianne Design and left the cardstock in the die. Next, I picked up my trusty Tim Holtz “Distress Inks” in shades of Spun Sugar, Picked Raspberry and Fired Brick. I blended them together from the lightest (Spun Sugar) at the top to the darkest (Fired Brick) at the bottom. I liked the gradient effect created, but it needed a to be darkened a bit, so I gently inked the edges with “Black Soot” Distress Ink. Once I was happy with the result, I removed the watercolour paper from the die. I now had an inked oval with a crisp white edge. Plain coloured backgrounds are great, but ones with extra texture and interest are even better! I sprinkled some Frantage embossing enamel in “Shabby Pink” and heat embossed it. The background was now completed. I’ve already used “Anja’s Vintage Decoration” for the top of the card, so to match it perfectly, I die cut “Anja’s Oval” frame out of the same burgundy cardstock. Both of these elements have lattice detailing which looks elegant and delicate. I think they work perfectly for a romantic card. I glued the inked background I prepared earlier in the middle of the frame I’ve just cut out. They came from the same die set, which meant the fit was perfect! Next, I adhered Josephine using dimensional foam and finally, affixed the whole focal piece to the card with 3D foam for even more depth. At this point, card was already looking pretty detailed, but as I like busy and intricate cards, I wasn’t going to stop just yet. Flowers are pretty synonymous with Valentine’s, so I wasn’t going to miss my chance to add some floral touches on this card. I chose a variety of mulberry blooms in different sizes and shades complementing the colours of the project. I also added some green stamens to make the composition look fuller. Just as I was contemplating what else I could do to balance the floral arrangement, I remembered that I had some tiny glitter bottles. I love using those, they really add the extra oomph to the projects due to their dimension and the fact that bottles are not things you normally expect to see on a card. As it happens, the pink glitter was not only the perfect shade, but also an allusion to the potion on the stamp used. I adhered the bottle using Glossy Accents by Ranger, this medium would probably glue a table to the wall, it’s that good! I picked a perfect sentiment for this card from the Wild Rose Studio “Love Circles” stamp set and stamped it in Versamark. I then covered it in fine pearlescent embossing powder and heat embossed. Next, I die cut the embossed sentiment into a stitched circle and, leaving the cardstock in the die, inked it using Distress Ink in “Spun Sugar” and “Picked Raspberry”. Once I was happy with the result, I removed the paper from the die. I had a perfectly pink sentiment to match my card. I usually mat circular sentiments on scalloped circles, I find that they just look neater and more professional that way. I die cut a scalloped circle out of the burgundy cardstock using Spellbinders “Classic Scalloped Circles” (S4-124) die set and glued the inked sentiment in the centre. I had some Tim Holtz Idea-ology memo pins, which looked pretty cool, so I thought I’d display the sentiment using a silver tone pin instead of just adhering the stamp to the card on dimensional foam. You already knew this one was coming, right? If you’ve seen some of my cards, you’ve probably noticed my signature double bows. I am quite fond of them indeed, so I’ve added one on this card too! I also adhered a textured fuchsia flatback gem to its centre. That crystallised sugar texture is just delightful, especially on a sweet card like this. As it’s a Valentine’s card, I couldn’t resist adding a few red foiled card hearts (try saying it fast three times in a row) to it. They were cut using Memory Box “Precious Hearts” dies. I also added some red gems as the very final touch, they coordinate perfectly with the foiled hearts and always make the project look complete. Have you finished making your Valentine’s cards already? What colour schemes do you tend to use - are you a traditionalist or do you tend to experiment? Don’t be shy, leave a comment, I enjoy reading each and every one of them. Thank you for reading and hope to see you back on my blog very soon!